I've been in two minds about whether to join this expedition, only really making my mind up ten days ago after a two week solo exploration trip. It will be my second expedition and my longest journey outside the bubble. 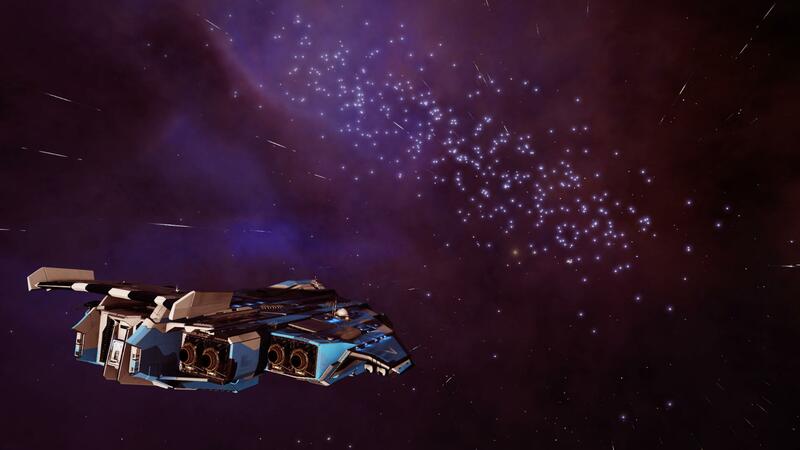 Up to now my longest journey in distance would be the trip I took around the core in my Beluga, taking famous explorers (tourists) to three different sites. The longest in time would be last Spring, shortly after earning my pilot's licence when I took a badly outfitted and partially engineered Diamondback Explorer out to Choomuia to show some planetary rings to some famous explorers (tourists). That was before I'd even heard of the Guardians so I didn't have an FSD booster. I took a detour to Colonia on the way back and just barely got back to the bubble within the four week limit. 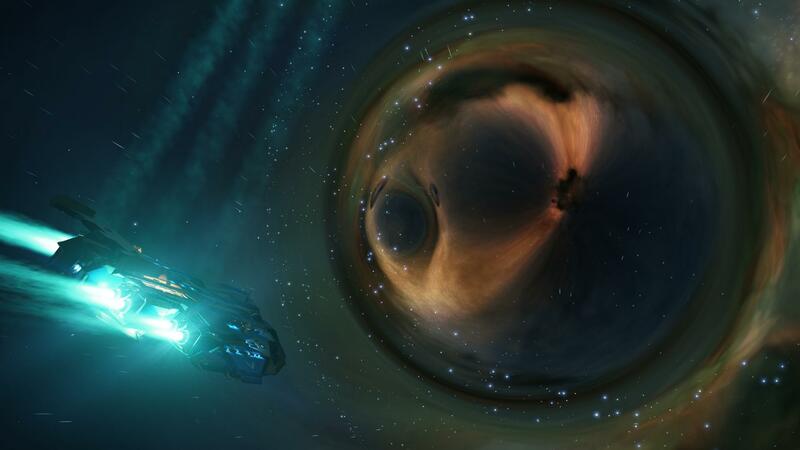 I've never actually been to Sagittarius A* or Beagle Point as no-one has offered me enough money to take them there and I'd normally prefer to be exploring less travelled regions of the galaxy. 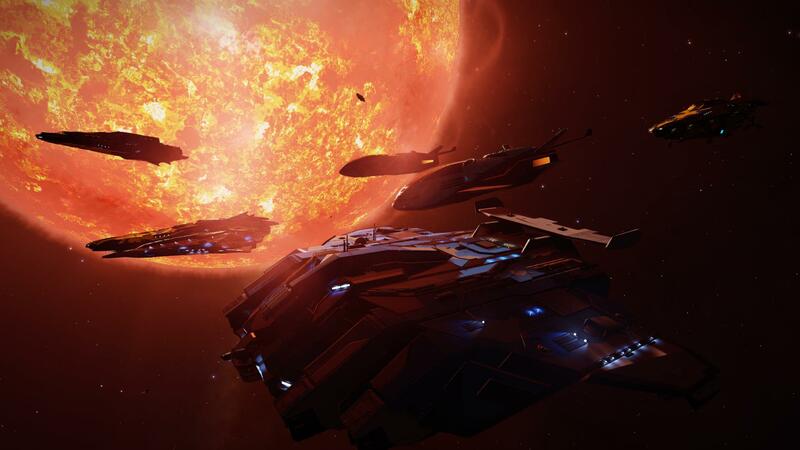 But I'm here in Pallaeni now in my new Type-10, What is Home?. I figured the large Lakon ships had a better view than the competition and I chose that over jumping farther with tiny windows. That would have been two ways to see less. Taking the 10 over the 9 was mainly about the bigger FSD drive. 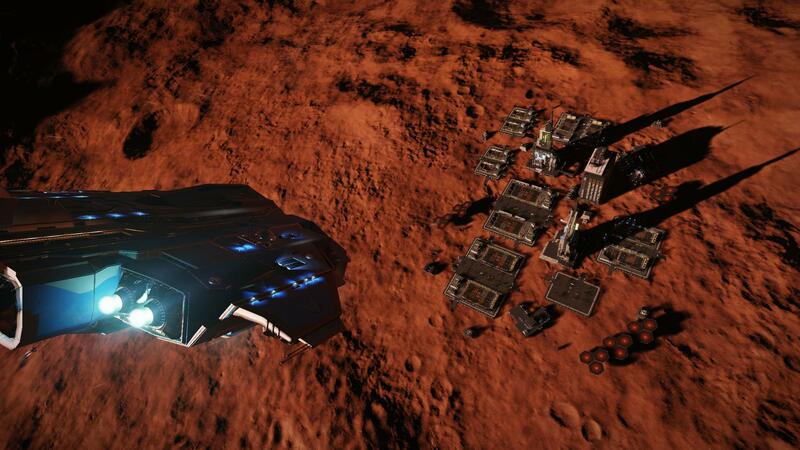 It has meant that I can carry more equipment whilst keeping my laden jump range a little over 45 Ly. And I figure that if I use the military modules for lightweight bulkheads and don't carry a shield then I'm not losing out on the number of internal modules I can carry. I'll colour the rest of the outfitting talk to make it easier for those that want to skip it. So while my power plant and distributor are each three classes smaller than they could have been and the distributor is class D, my thrusters are full-sized 7As. This should make landing on high-g worlds much safer. Well over half the cost of the ship was spent of the 8A fuel scoop which can fill my 64t tank in under 40 seconds. A luxury, but not a heavy one. I had planned to shield the fuel scoop but took the advice I heard on Lave Radio to leave it unengineered and fit a smaller power plant. That power plant is armoured which improves efficiency, output and integrity. The output and integrity boost partially compensate for taking such a small one and the efficiency makes travel a little safer. Lots of pilots would take an even smaller plant and overcharge it but that makes heat a real problem. I have a 7D Fighter Hangar and a 6G Planetary vehicle hangar. The weight of these is significant but SRVs are increasingly important for serious exploration and the fighters might help stave off space-madness after Sagittarius A*. A grade 5 FSD booster seemed essential, though I guess if I were a more dedicated fleet mechanic I could have downgraded it to fit in a bigger repair limpet controller. The 4A AFMU seems a bit sub-par for such a large ship but it'll do. I did shield that as I have no way to repair it other than reboot/repair. Besides it only needs to switch on when other modules are powered down for repair. Power priorities are magic. I used the other class 4 slot for a corrosion resistant cargo bay. I don't think we'll pass through thargoid space but then you never know what you'll find when exploring. As I'm shieldless I'll be carrying a 3D repair limpet controller. That will let me repair another pilot at the same time, handy for any minor collisions at the gatherings. Then I'm taking a research limpet controller. Mad you say? Maybe, but we just don't know what we'll find. I nearly swapped it for a fuel limpet controller but I think the expedition will have plenty of rats. I'll take the best science ship I can cobble together. Of course I have a Detailed Surface Scanner too, and that rounds out my optional internals. A refinery and a larger cargo bay would have been nice, but even in an armoured warehouse with engines bolted on you can't take everything. 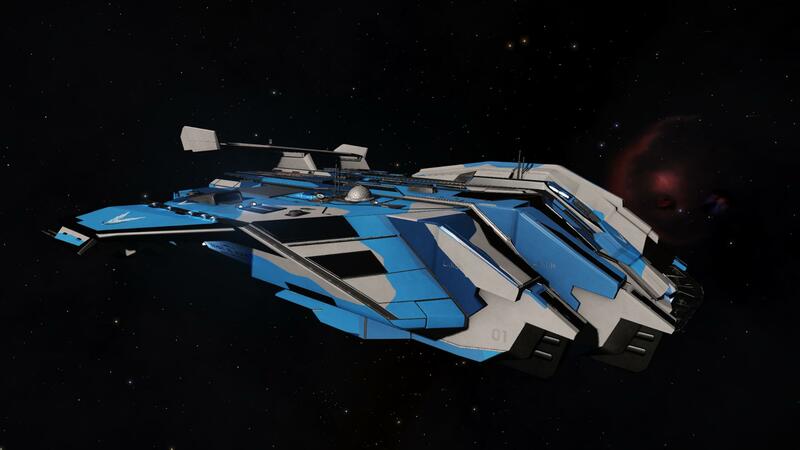 I wanted to fill my hardpoints with lightweight pulse lasers but, due to alloy shortages, I just have two small gimballed and two large turrets. To be honest that's probably about all the distributor can cope with anyway and I'll be relying on the fighters for defence. 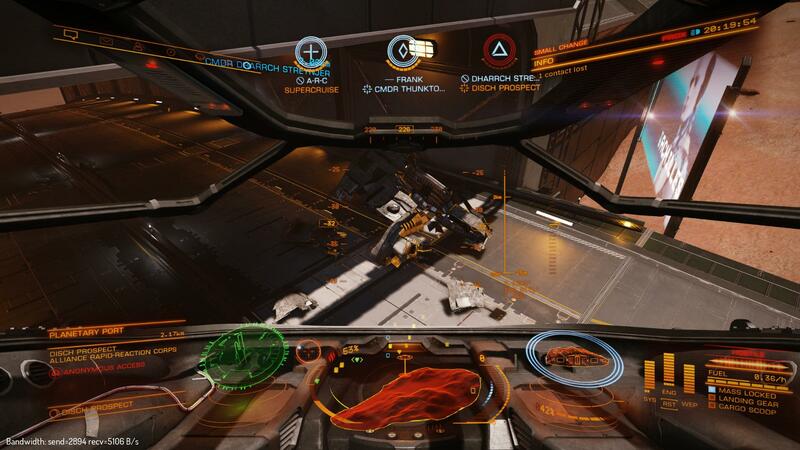 Utility mounts contain two each of heat-sinks, chaff and point defence, plus wake and xeno scanners. After engineering the wake scanner weighs a fraction of a ton and I can keep it switched off most of the time. The xeno scanner is a little heavier but it draws no power until the hardpoints are deployed. I don't mind a few things switching off at that point. In fact the power plant simply won't run everything even after the wake scanner is switched off. The planetary vehicle hangar doesn't power up until I land and power down my thrusters. And the AFMU gets no power until I start switching modules off for repairs. Both of those seem fine to me. Switching the FSD off when hardpoints deploy is riskier but I'll just have to be careful about which fights to stick around for and which to run away from. Back to the expedition. A bunch of us have gathered next to a small mining operation a few kilometres from Brooks Point in Pallaeni. I've had a few fly-bys in a Condor and driven my Scarab around a bit. 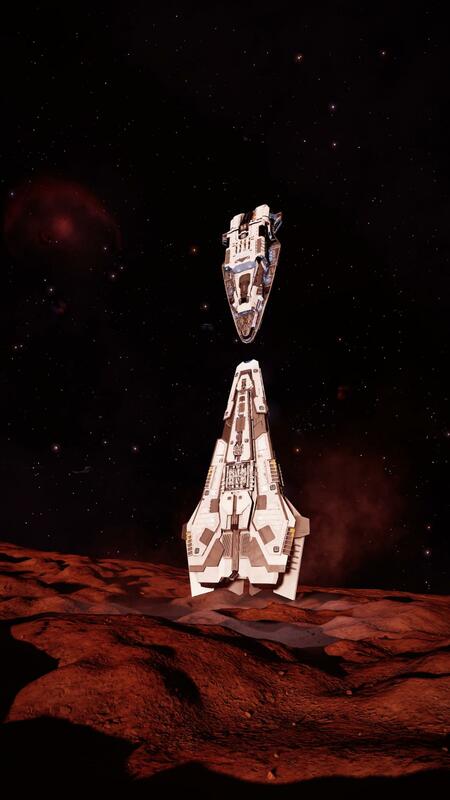 One Anaconda decided to park on it's rear like an antique rocket and someone in a Python hovered nose-down above them making a strange totem. We'll be moving on to a nearby tourist beacon soon to prepare for a mass jump, the biggest ever by an order of magnitude. I can't say the mass-jump went off without a hitch, though the organisers seemed happy enough. Communications across such a large fleet haven't been attempted before and contact was broken. Alternatives were arranged, but no-one told me. I'm sure I wasn't the only one. I happened to end up close to one of the organisers, DR Kaii and so lined my ship up with his. Then about five minutes before the scheduled jump he turned his ship around. Someone's Beluga collided with What is Home? as the fleet turned to it's new heading, denting both our unshielded hulls. A couple of limpets was enough to repair both ships. I received no message about the target system and was unable to locate one in the right direction before the jump time. So I had to settle for low-waking out. 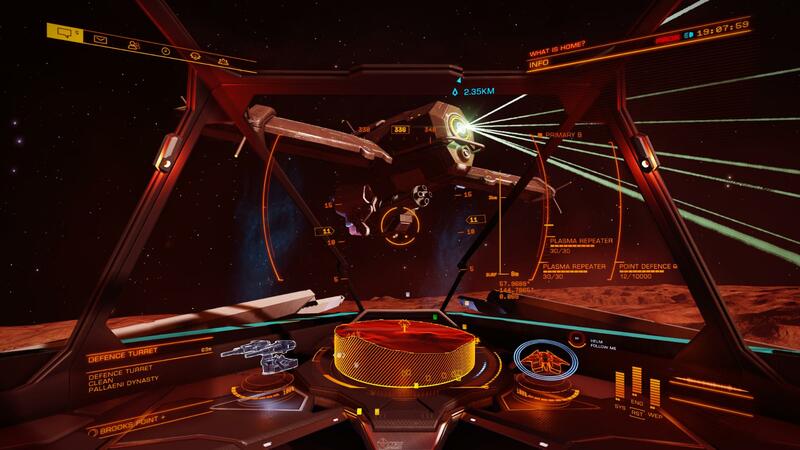 A significant fleet appeared in supercruise around me, so I clearly wasn't the only pilot to experience this issue. So the expedition has begun, but I'm back at home with my feet up drinking Fujin Tea. I won't leave until Thursday the 17th. Disch Prospect is one of those planetary bases with the circular wall around it. There's a nice ring road going most of the way around that I've been thinking for a while looks good for racing. So tonight, that's what we've been doing. The base has two roads leading in, on opposite sides, so I plotted a route from one side to the other using half the ring road. I guess the bureaucrats here are arguing about what sort of junction they prefer because the ring road fades to dirt near each exit. So remembering the route is easy. You run out of road twice and in one direction you turn left both times, in the other direction it's right. I think we raced four times in our Scarabs, which we were able to launch from the hangars. I won one of these races and made a decent performance in the other two. The one I won I did it by boosting over the others to overtake, so I'm not sure if there ought to be some limit on that. We did say you had to pass through every "gate", so maybe that's enough of a limit. Personally I thought stock Sidewinders were more fun. It's handy that they are available on-site. At full speed they drift too far to get through the gates, so there's a real question of how fast you dare to fly. The great thing about Sideys here is that you can fit two through the gates, one above the other. That makes overtaking possible at any point in the race. I won by a large margin in my Sidewinder, but then I had had more practice than the others. It'll be interesting to see if they put some practice in while I'm away. I decided to take quite a direct route in order to catch up with the fleet sooner. So I haven't been using the star class filter. Another effect of this is that I'm getting a lot more new discoveries, even if most of them are ice planets orbiting brown dwarfs. Using FSD boost would only have reduced the journey by a single jump so I'm not bothering with it. The M20 and M21 sectors are proving a little tricky. My route planner is failing to add sufficient fuel stars to my route and I'm having to plot shorter sections of the route to avoid a call to the rats. I'm getting quite proficient with the DSS now, though of course engineering it has removed the challenge I still like to fire off an efficient pattern as fast as the autoloader allows and move on the the next target, or start charging up my FSD. 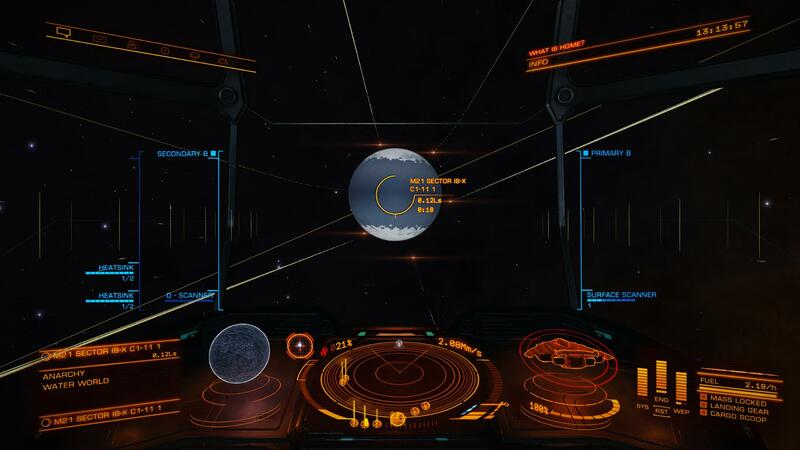 Someone in the Fleetcomm Science Department shared a bookmark for this system. It's one of those O-type stars orbited by a black hole, but there are some nice views of the Lagoon Nebula through the gravitic lens. A couple of other pilots passed through while I was here, something that would have been much less likely on a solo trip. I'm delighted by the way What is Home? handles heat. I got it as hot as it has ever been in Thor's Eye by charging up my FSD next to the body exclusion zone of the black hole and boosting into supercruise. 98% heat, I nearly had to drop a heatsink. I stocked up heavily on the gizmos I need to synthesise more heatsinks but it's looking like six might be plenty. From Thor's Eye it was a short hop to the Lagoon Nebula, so I decided to make an unscheduled stop at Amundsen Terminal. 10,000 people live here. An order of magnitude more than my current(?) home of Quator. The people are happy and industrious in spite of an ongoing pirate incursion raiding their supplies. I don't know how they're even managing to feed themselves, let alone thrive like this. This world of theirs is scorching on one side and icy on the other with nightmarish seasonal swings in the twilight zone. Tomorrow, or perhaps later today, I shall go and map the system where I discovered my first earthlike. I hope I can get there before anyone else stumbles on it. It's not that far from waypoint 2. The gravity here may be low, but I'm still going to take the opportunity to go for a walk. It's a luxury I'll lose in a few weeks if I stick with this expedition. 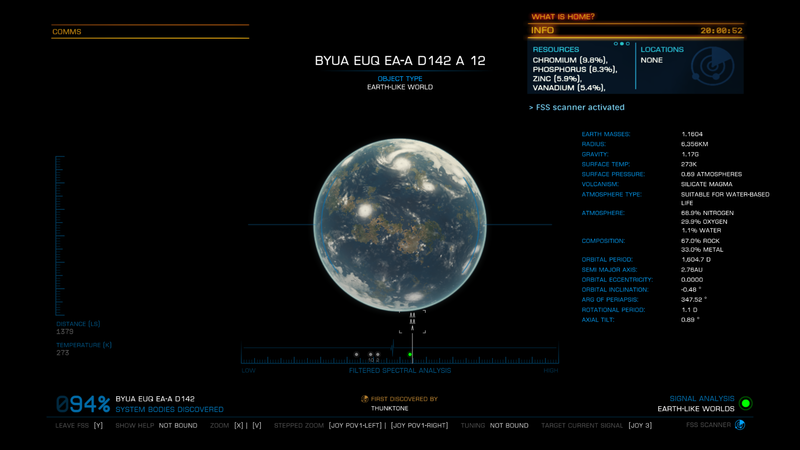 I mapped the entire stem of Byua Euq EA-A D142, including my first earthlike discovery. It was "only" 508.75 Ly from this mining base but it seems I am still the only human to have been there. This galaxy is big and my head hurts. Compliments to the organisers on choosing this waypoint. The Omega Nebula is gorgeous. We're supposed to be mining resources to build a new base near the centre of the galaxy. They have everything I could want here to temporarily refit my Type-10 as a laser miner. Except shields. I've got an engineered, low power 6A generator at Jameson though, so I reckon I'll have that sent out. I'll send for a bigger power plant too, I suspect I'll need it to power the shield. Time to ring some changes?